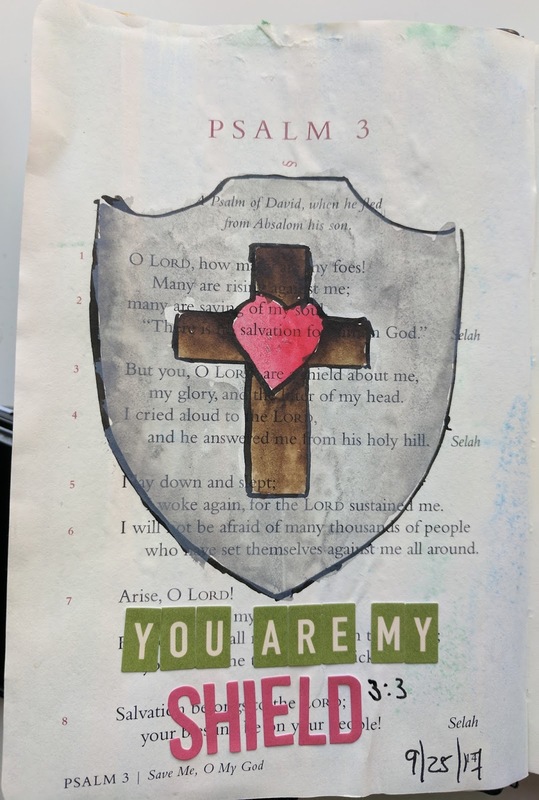 My plan with my Psalms book is to keep it simple because I don't think I can add a ton of layers to each chapter and have it all still fit in the book. I read each chapter and sometimes do some Googling about the chapter meaning. To create the shield I found some clip art on Google that I printed and traced. I'm horrible at freehand drawing so I try to find something I can trace or just glue into my book. I used the Classics watercolors to color and for the words, the green block are from October Afternoon and the red are Simple Stories. Hi, I'm Ann. I've been crafting in some fashion most of my life. I mostly do scrapbook layouts, cards, and bible journaling. Why do I call myself a B-Side Crafter? Almost anytime I pick up a paper product I love the back side or the "B-Side" it's normally a bit more muted and simple in pattern which fits my style.